Timothy Leatherman is the founder and CEO of Leatherman Tool Group. If you like to tinker around in your garage and you own a lot of tools, then there’s a good chance that you have a Leatherman multi-tool in your toolbox. Timothy Leatherman is a mechanical engineer who graduated from Oregon Statue University. He is said to have come up with the idea for the multi-tool while driving through Europe with his wife in a car that repeatedly broke down. The idea came after failed attempts to fix the car with his pocket knife. In 1983, he started the Leatherman Tool Group with Steve Berliner. 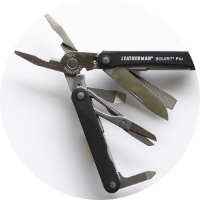 Today, the Leatherman Tool Group is a global company with sales in over 80 countries. Timothy Leatherman has a few fellow business legends and inventors in his family tree including Walt Disney, Gilbert Noble (co-founder of Barnes and Noble), Thomas Watson, Jr. (President and CEO of I.B.M. ), lockstitch sewing machine inventor Elias Howe, Morse Code inventor Samuel F. B. Morse, and air conditioning inventor Willis Carrier. He also has kinship to a few celebrities including actress Lucille Ball, television’s Bill Nye the Science Guy, NFL Hall of Fame quarterback Steve Young, NBA All-Star player Kevin Love, and The Beach Boys Brian, Carl, Dennis Wilson and Mike Love. Other historical figures with family connections to Timothy Leatherman include Mormon church president Brigham Young, poet Emily Dickinson, and U.S. First Lady Lucretia Garfield.